1932? Heck, that’s every Friday in some offices I’ve worked in — and schools. Tip of the old scrub brush to Devona Wyant. Thanks to Thierry Warnaers for writing in to identify himself (see comments). It’s largely forgotten now, especially in history texts in high schools. After the Spanish-American War, when the U.S. wrested several territories from Spain, including Guam, Cuba, Puerto Rico and the Philippines, the U.S. quickly got mired in one of the original guerrilla wars in the Philippines. It took 15 years, but the U.S. finally put down the rebellion — 15 brutal, bloody years. The conduct of that war shocked many people, including Mark Twain. This piece was written partly in response to that war. Many Americans, like Twain, who questioned the war, in turn had their patriotism questioned. Why wouldn’t they get on board with the war, and kill off those Filipino rebels? the critics asked. Here’s a film in two parts, a stunning production, produced and directed by Markos Kounalakis (who uploaded the thing); go to the film’s website for a copy of the text. Why didn’t I notice this in 2008? The film is narrated by Peter Coyote. Poet Lawrence Ferlinghetti plays the minister. Erik Bauersfeld plays the Stranger. Another short film of The War Prayer came out in 2007, from Lyceum Productions. Neither version appears to be available on DVD or Blu-Ray. Too bad. Some guy who goes by Joeyess seems to be the one who put this together — wrote the song? Performed? Call it sequencing. Students often ask — at least once a week — whether I was a hippie. They figure that’s a possibility since I don’t like much of the rock of the ’80s, and they don’t know much history of the ’50s and ’60s. They don’t believe me when I tell them I thought college was a better idea. They look confused when I tell them I was a plainclothes hippie. Noodling around the radio dial the other day, I wondered how an antiwar movement could work with ClearChannel running so much of the radio formats, and none of the formats being exactly friendly to the slightest political commentary. So, take a look. Tell us what you think in comments. Tip of the old scrub brush to Pharyngula. Here’s a film in two parts, a stunning production, perhaps by Markos Kounalakis (who uploaded the thing); go to the film’s website for a copy of the text. While we wait to see whether someone will confess to PhotoShopping this picture, we teachers might consider using this photo as a hook for a lesson on the differences between the rising totalitarian state of Nazi Germany in 1936, and the rising, increasingly economically free state of the People’s Democratic Republic of China today. One more lesson plan for this year — it’s reusable next fall, with the added bonus then that by then you’ll have the headlines of the actual Olympics to add to the discussion. Update: The photo is said to have been was taken by Rowan Benum at a California site (see Mr. Benum’s comment). Since it’s all the rage on conservative sites, where the history ignorance is condemned but the conservative bloggers can’t quite bring themselves to endorse the Communist Chinese, I strongly suspect wondered about a PhotoShop origin. The torch was run through San Francisco; there are few palms in San Francisco (Californians: Can you identify the location?). Update 5-13-2008: The photographer kindly dropped by comments to note the authenticity of the photo. I agree, the Tibetan prayer flags suggest authenticity; would a hoaxer think of such details? There is a wealth of information for classroom use at the website of the IOC. If you’re particularly adventurous, or deep into this topic, check out the podcasts of Olympic history from amateur historian Eli Hunt. Students should also have some information about Tibet, and the Dalai Lama and Tibet’s government in exile, about the history of Tibet and China’s actions since World War II. Students should have some history of the 1936 Olympics, and they should be familiar with the stories of Jesse Owens’ accomplishments there and his return to a segregated U.S. You may want to provide an article about the U.S. protest of the 1980 Olympics in Moscow, and the Soviet protest of the 1984 Olympics in Los Angeles, and other Cold War moments of Olympic tension. Since the International Olympics Committee (IOC) is an avowedly non-political international agency, is it fair or rational to protest the siting of an Olympics on political grounds? What do the protesters ask the IOC to do? What do the protesters ask others to do? Under international law, what are the rights and duties of the Peoples Republic of China (PRC)? Did the IOC ask anything of the government of the Peoples Republic of China of a political nature? Would such requests be fair, or rational? Other international organizations function in other nations where governments do not have good records on human rights, such as the Red Cross/Red Crescent, Scouting, UNICEF, and others (can you add to this list?). What considerations must such organizations give to local politics where human rights are at issue? Compare and contrast the issues surrounding the Beijing Olympics with issues surrounding the Myanmar relief efforts after Cyclone Nargis (2008). Look at other protests involving the Olympics, especially in 1980 and 1984. Did those protests achieve what the protesters had hoped? Does the success or failure of past protests augur well for current protests? 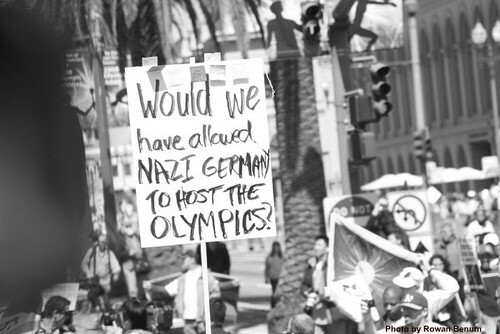 The creator of the protest sign in the photograph appears to have not known about the 1936 Olympics, which were hosted in Berlin, then under the control of the Nazi government of Germany. The Olympics were sited in Berlin prior to the rise of the Nazi government. 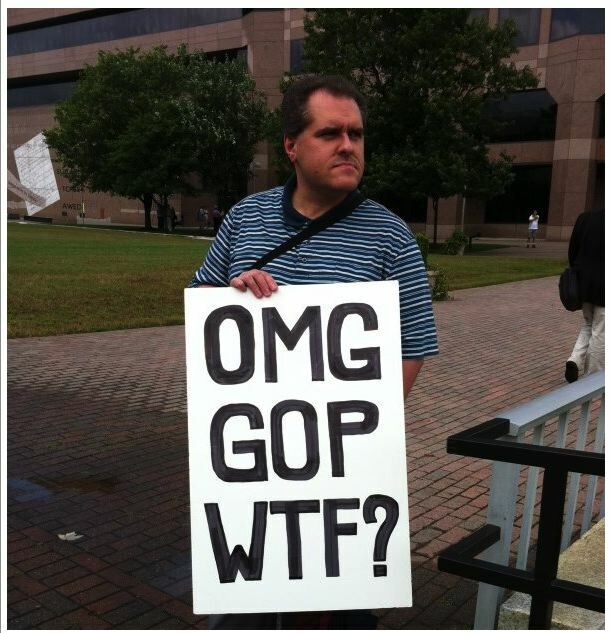 Does the protester’s ignorance of history affect the message of the sign? Does it reflect well on the cause the protester advocates? What other famous or notorious examples of ignorance of history can you find? Do you ever get embarrassed for the people captured in Jay Leno’s “Jaywalking” segments? An Associated Press story in the Boston Herald notes three recent incidents in which U.S. flags were burned, in what appears to be a protest of some sort. Police say a flag-burning incident in Northampton may be the work of an anti-American anarchist group. The 5-by-9 foot American flag that hung from a birch tree outside of Eamon Mohan’s house on Bridge Street was reduced to ashes in the Friday night blaze. A typewritten note left at the home and signed by the “American Patriot Liberation Front” claimed the United States was oppressing millions of people around the world. But police say they are unfamiliar with the group. Police are investigating whether the flag burning is linked to two other incidents in western Massachusetts this month. A post office flag was thrown in a Dumpster and burned in Greenfield earlier this month and an American flag was stolen last week from outside a home in Amherst. Notes similar to the one in Northampton were found in both cases. U.S. flags should not be displayed at night, unless lighted, or unless the site is specifically exempted from that condition of flag display by an Act of Congress. Mohan’s family did not appear to be targeted, police said. Mohan’s daughter, Megan, 19, is a US Marine, currently in training, and his son, Eamonn, 17, plans to join after his 18th birthday next month. The note was signed by the “American Patriot Liberation Front.” Police said they were unfamiliar with the group. The group is not listed in the telephone directory, and no contact information could be found for it on the Web. The protesters appear able to write: Why not a letter to the editor of the local newspaper? Such protests, to the point and to a greater audience, are part of what the flag stands for. The flag burners probably don’t note the irony. Stupid protests give a bad name to protest.